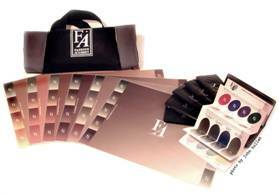 Fashion Academy has developed an easy to use color analysis system. Spectrum Determining Cards are a great new tool that will aid the fashion industry in selecting clothing, makeup, and hair colors that harmonize beautifully with a client's natural coloring. Could this mean the end of closets full of unworn clothes, drawers full of unused makeup, and unbecoming hair colors? Lisa Byrd Thomas, Marketing Director for Fashion Academy, said that this innovative system is the result of over 30 years of research and experience in skin tone analysis. The system uses six determining cards to categorize all skin tones worldwide into three warm and three cool spectrums. The cards make this different from other color analysis systems. The client literally sees for themselves the difference between warm and cool skin undertones and why certain colors look better on them, explained Thomas. Each spectrum card is a range of skin tones, shaded from light to dark. Also included on each card are all the eye and hair colors that naturally appear within that range of skin tones. The client's skin, eye, and hair color are simply matched to the cards to identify the correct spectrum. Colors for clothing and makeup for each spectrum are on separate coordinating palettes. I think that the system is of great value in teaching colorists how to target the right color for their clients, one that will coordinate with their makeup and wardrobe. The required 4-hour Spectrum Determining Card training course is held at various locations nationwide. Learn more at the Fashion Academy website.